In the 1960's the city of Toronto, Canada, was in a building boom. The town, which had consisted for many years as mostly smaller buildings, was erecting a number of new skyscrapers which rose towards the heavens. While this made the skyline of the city exciting to look at, it also caused some problems, too. The new, tall buildings blocked TV and radio communications as well as the microwave transmissions used to move data between many businesses. To resolve this problem the Canadian National Railway (CN) decided to build a communications tower tall enough so that any radio or TV communications from it would not be obstructed by other high-rise buildings in the city. The tower would also serve as a hub for microwave transmissions, allowing two businesses that were not visible to each other to exchange data by having the tower retransmit it. The project officially got underway in 1972. During the planning stage it was decided to add an observation deck. Engineers soon realized that with some fairly minor changes to the project, the structure could be turned into the tallest tower in the world. Many businesses, cities and even nations have vied for the privilege of claiming the world's tallest man-made structure as their own. Determining who holds the record, however, is not as easy as it seems. For example, in 1963 the KVLY-TV mast in North Dakota, USA, was built. With a height of 2,063 ft (628m), at the time it was the tallest structure of any kind in the world, quite a bit bigger than the previous champ, the Empire State Building (1,250 ft/381m). However, it seems unfair to unconditionally award the record to something like the KVLU mast. It was a simple, open, steel tower without any habitable space and needed the assistance of guy wires to keep from falling over. The Empire State Building had over a hundred floors of office space and was a freestanding structure. Because of this, the structures vying for the world's highest record have been put into categories based on their usage and design. The new CN Tower would fall into a category known as the "world's highest free-standing tower." In this category the structure can't have any guy wires to hold it up. A tower can have some habitable space, but differs from the world's tallest building category because it doesn't have habitable space on every floor throughout the stucture, as an office building like the Empire State Building does. Construction of the CN Tower started on February 6, 1973. First, a huge excavation was made and a twenty-two-foot thick base made of concrete, reinforced with rebar, was poured. After this hardened, the actual construction of the tower began. The tower was also made of concrete. A special form was built in the shape of the cross-section of the tower (a hexagon with rectangular extensions on three of the sides). Concrete was mixed on site and pumped into the form. As the concrete hardened, the form was pushed upwards by a set of hydraulic jacks. The form was constructed so that as the tower got higher the rectangular extensions could be made shorter and the building would taper into almost a simple hexagon toward the top. In the course of the construction, 52,972 cubic yards (40,500 cubic meters) of concrete were poured into the form to make the tower. The concrete is the bulk of the structure's final 130,000 ton (117,910 metric ton) weight. Construction required 1,537 workers and continued day and night, five days a week. The form climbed upward at the rate of about twenty feet every 24 hours and by August of 1974 work on the "sky pod" could be started. The sky pod, which would look a little bit like a fat, flying saucer when completed, would eventually contain an observation deck, gift shop and a revolving restaurant. The sky pod was also made of concrete poured into a wooden and steel form and reinforced with rebar. The very top of the tower was designed as a 335-foot (102m) TV and radio antenna that would be built on the ground and lifted by sections onto the top of the tower. Originally its 36 pieces were to be put into place by a crane, but when a 10-ton Sikorsky S-64 Skycrane helicopter became available it was used to lift the pieces instead. Disaster nearly struck during the the first phase of the operation when the helicopter attempted to remove a crane that had been mounted at the top of the building. After the Sikorsky was attached to the crane the crane shifted, jamming the bolts that held it to the tower so the crane could not be released. This meant that the helicopter, which only had 50 minutes of fuel left, was teathered to the building and couldn't land. Steel workers had to scramble up onto the tower and use torches to burn away the bolts and free the crane and copter so they could safely pull away from the tower. They made it down with only 14 minutes of fuel left. The rest of the construction using the giant helicopter went without incident, however, shortening this phase of the assembly considerably from six months to just three and half weeks. The CNN tower was finished at the cost of $63 million. It opened to the public on June 26, 1976, with an official opening celebration on October 1. Visitors could access the sky pod (now called the "main level") via elevators that ran up the legs of the structure. The outside observation deck is 1,122 feet (342m) above the ground. 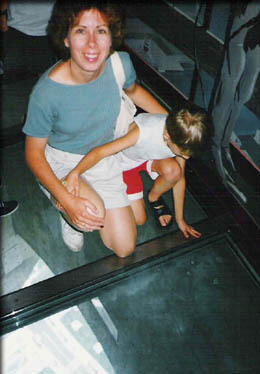 This level also has a "glass floor" which allows visitors to stand on transparent material and look downward to the ground, an experience that can cause acrophobia in some people. The emergency staircase up the interior of the tower is the longest in the world with 2,579 steps that go to the top of the sky pod area. While these stairs are normally closed to the public, twice a year they are used for charity stair-climbing events. An average climber takes about 30 minutes to reach the main level, but some athletes have made it in less than eight minutes. 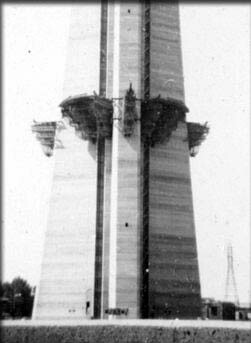 There have been a number of improvements to the tower since its initial construction. The original emergency staircase was relocated from inside one of the legs to the core to allow two more elevators to be installed, bringing the total to six. In 2007 the original incandescent lighting was removed and replaced with 1330 LED lights. This not only increased energy efficiency, but allowed for light shows to be programmed and controlled from a desk-top computer. When the structure was completed in 1976, the height to the top of its spire was 1,815.4 feet (553.33 m) which made it the tallest tower in the world and broke the old record held by the Ostankino Tower in Moscow (1,772 ft - 540.1m). It held this record until 2010 when it was surpassed by the Canton Tower (1,968.5 ft - 600m) in Guangzhou, China. Since then several other structures have been completed that are even higher. As of 2011, however, it remains the highest tower in the western hemisphere. Though the Canadian National railway sold the building in 1995, it continues to be known as the CN Tower with the CN standing for "Canada's National Tower." It welcomes approximately 2 million visitors per year and remains even today a symbol of Canada's vitality. In 1995 it was declared one of the Seven Wonders of the Modern World by the American Society of Civil Engineers.